Ha-ha - But seriously, organic food is safe for you skin , why wouldn't it be? Packed with vitamins, antioxidants, this super-simple 1 ingredient exfoliating mask is cheap, safe, deeply moisturizing and super yummy for your skin! 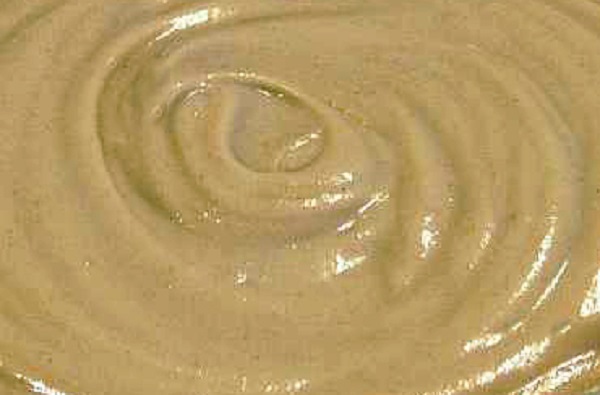 The sesame oil naturally occurring from the ground sesame seeds in tahini is extremely beneficial for the skin. High in it's own naturally occurring vitamin E, sesame oil is a very good emollient and moisturizer, which keeps your skin moisturized hydrated and nourished. This deep-penetrating oil is absorbed by the skin very easily, which helps skin feel hydrated and rejuvenated for longer periods of time. Sesame seeds contain lignans, including unique content of sesamin, which are phytoestrogens with antioxidant and anti-cancer properties. Among edible oils from six plants, sesame oil had the highest antioxidant content.. The antioxidants in sesame oil prevents free radical damage, helps reduce the appearance of fine lines and wrinkles and maintains youthful skin. The properties of sesame seed oil is also said to be useful in the repair of damaged skin cells and to rejuvenation the skin . It improves blood circulation and penetrates deeply into the capilaries which helps repair damaged skin and gives a healthy glow. Sesame oil is also great for summer skincare as it has natural sun sun-screening properties and antioxidants which can protect your skin from sun damage. Sesame oil helps detoxify the skin by attracting and trapping oil soluble toxins. Topical application of sesame seeds and sesame oil have been known to be beneficial in the treatment of psoriasis, eczema and acne. Because of it's oil pulling & detoxifying properties, contrary to popular belief that oils are bad for acne prone skin, sesame oil helps control acne which develop both on the surface and deeper in the pores. Sesame seed oil and it is not known to have any side effects when applied topically.